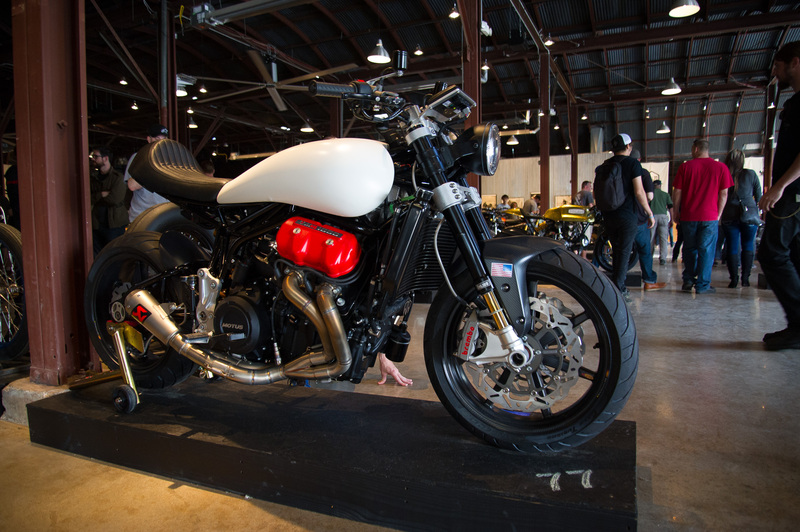 Just as it is easy to compare Austin to Portland, one can do the same with the One Show and the Handbuilt Show — in fact, you’ll even find some of the same machines at both events (and that’s not a bad thing). 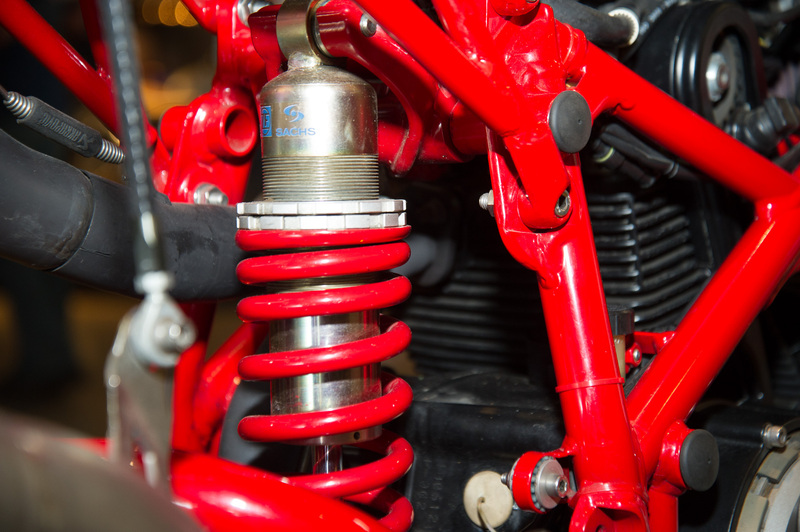 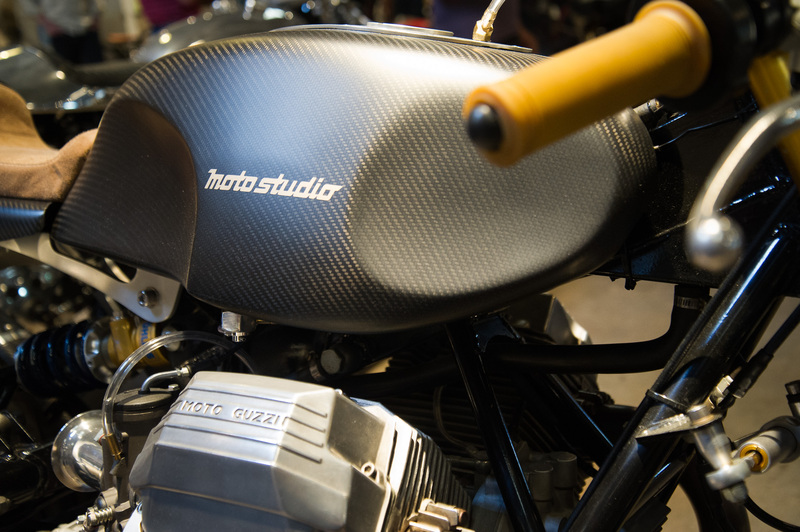 Despite the One Show being our home event, the subtle differences between the two motorbike exhibitions make the Handbuilt Show the superior night out, in our opinion…even if only by a thin margin. 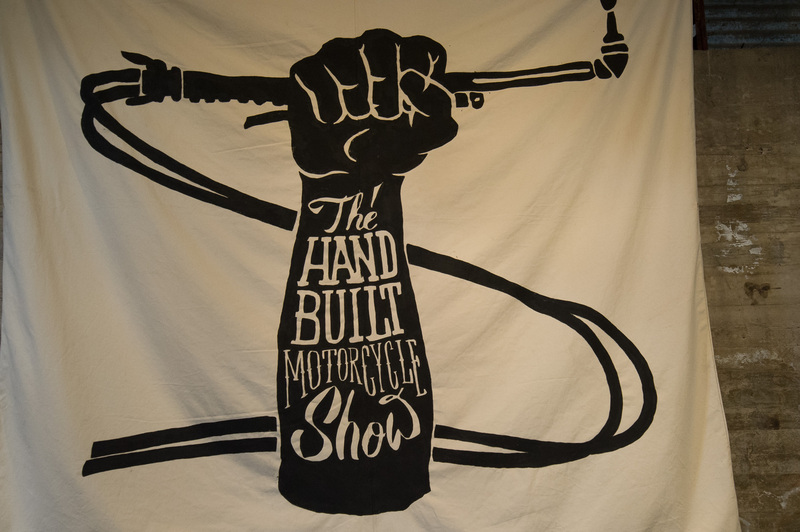 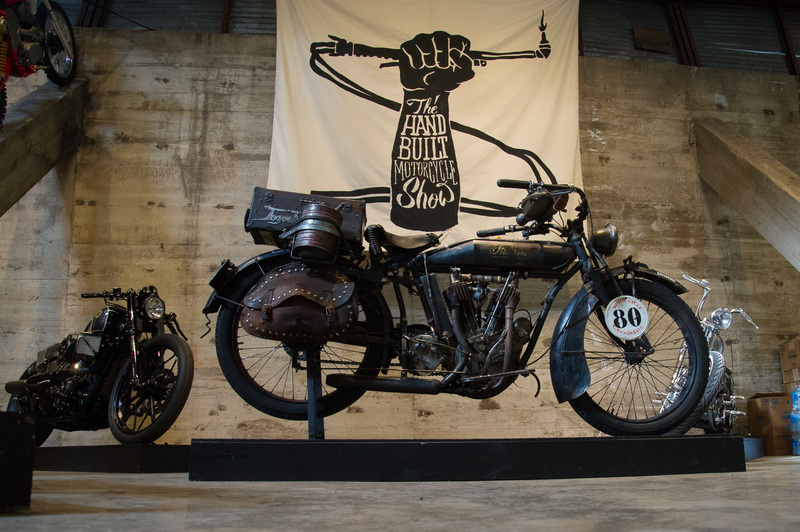 Maybe it’s the weather, or maybe it’s the carefully curated bikes on display, but there’s a polish to the Handbuilt Show that elevates it slightly beyond frat-like atmosphere in PDX…it could just be the “beautiful people” coming in from COTA to poke around, who class the place up. 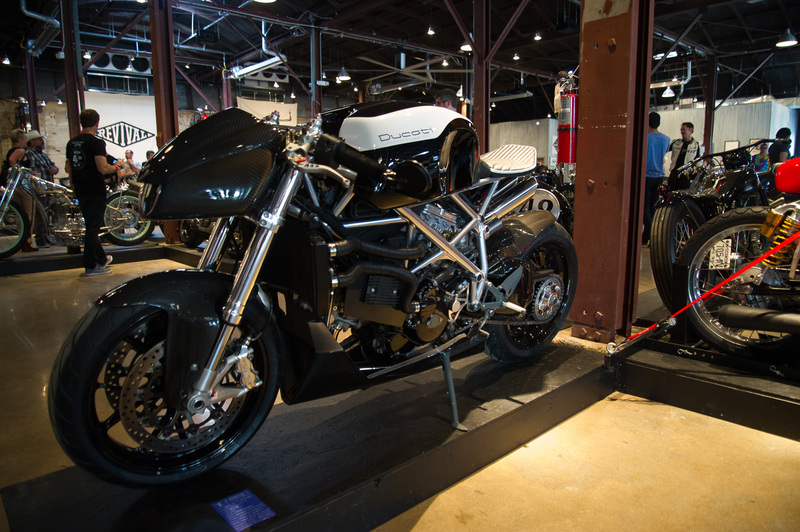 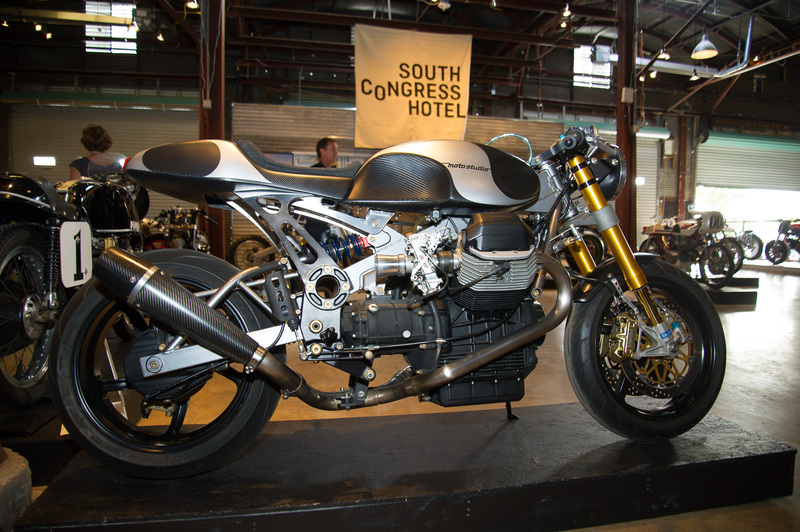 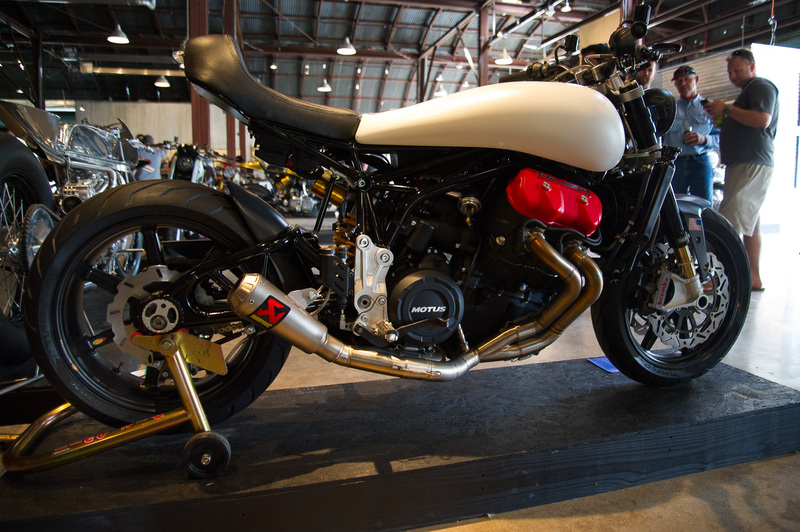 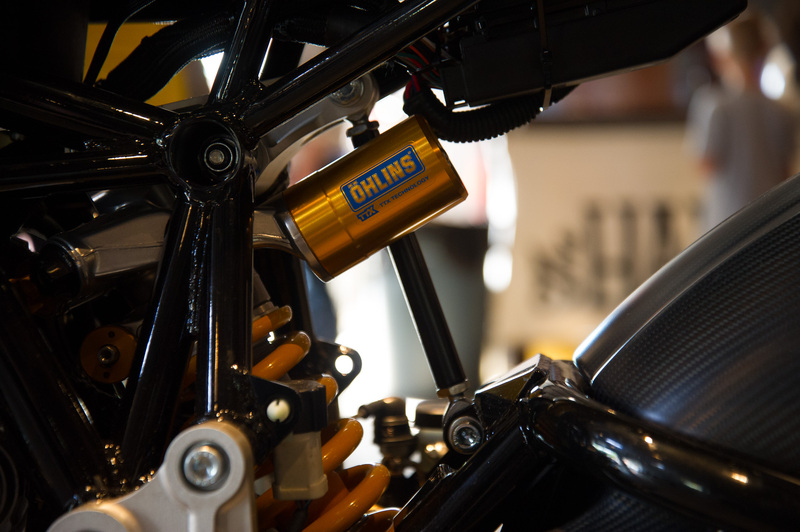 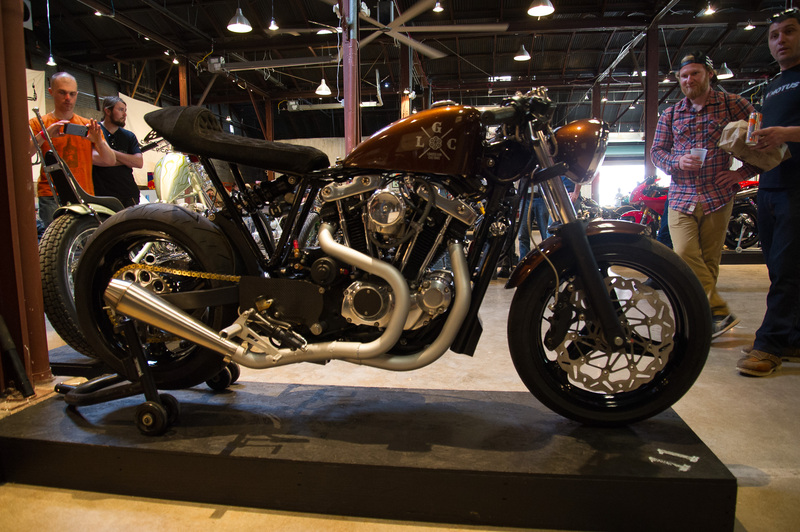 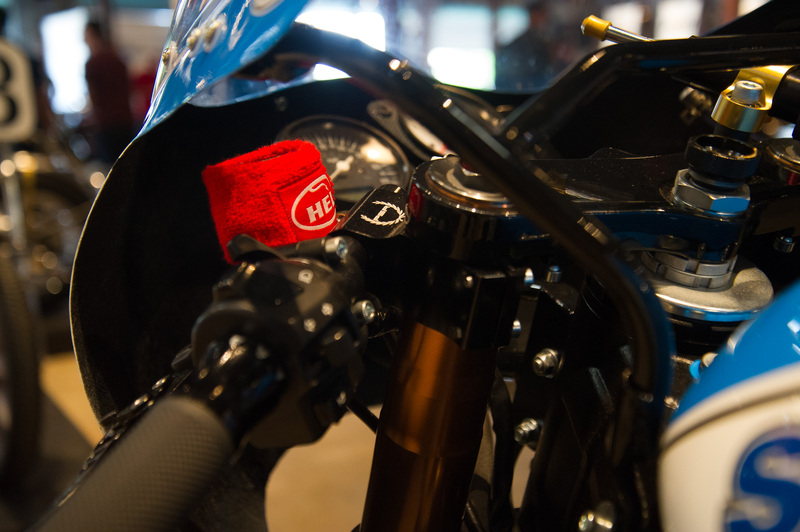 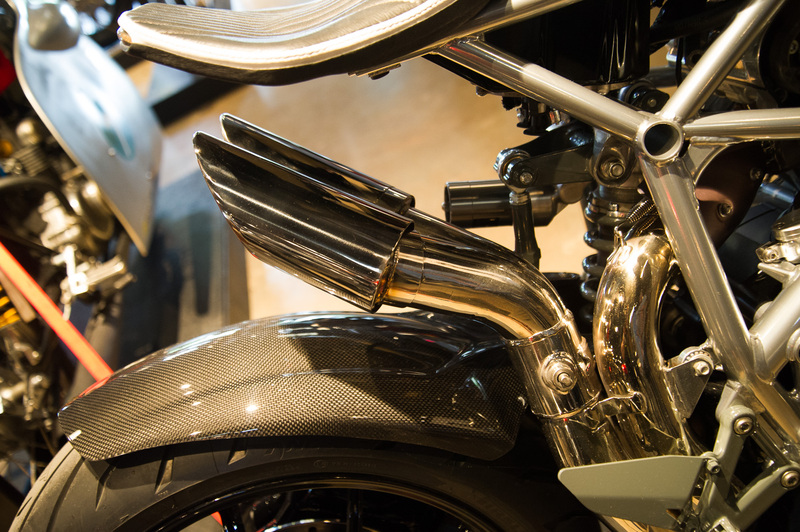 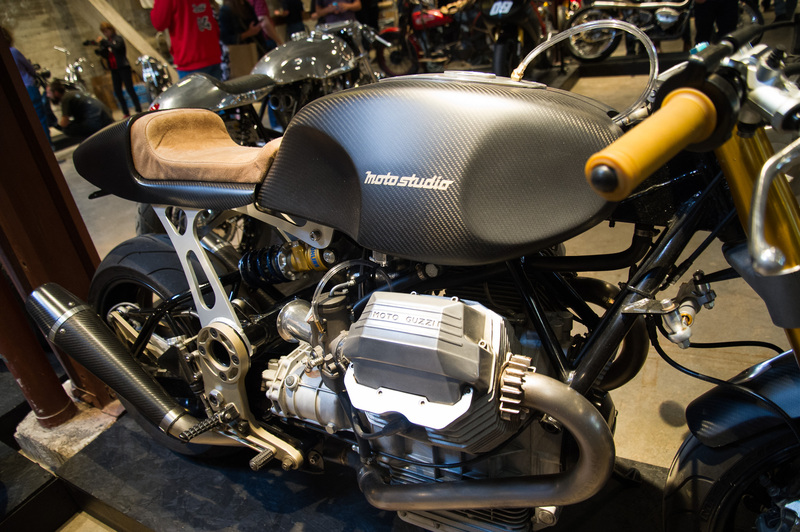 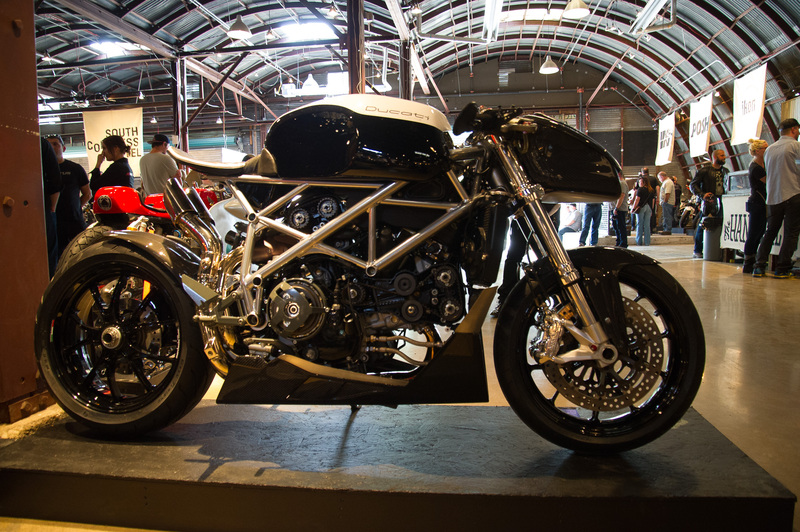 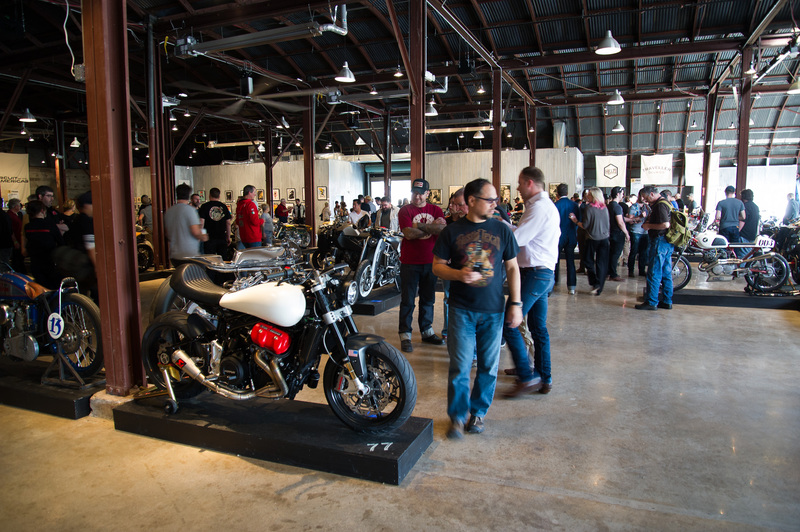 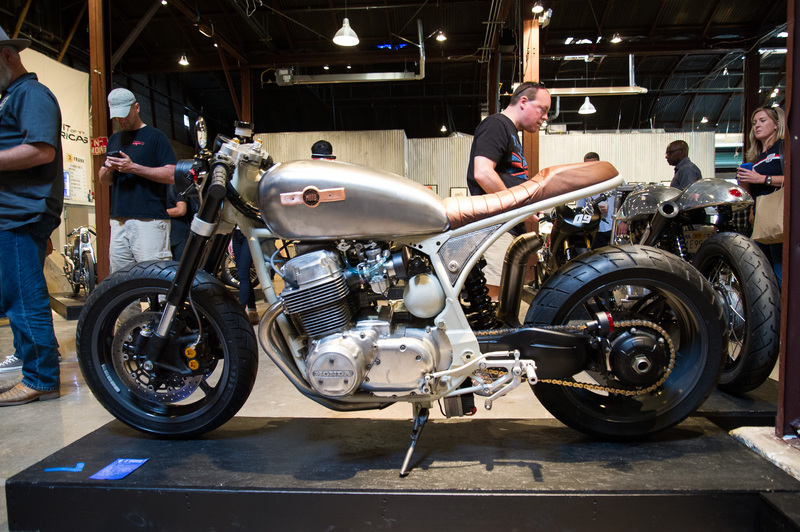 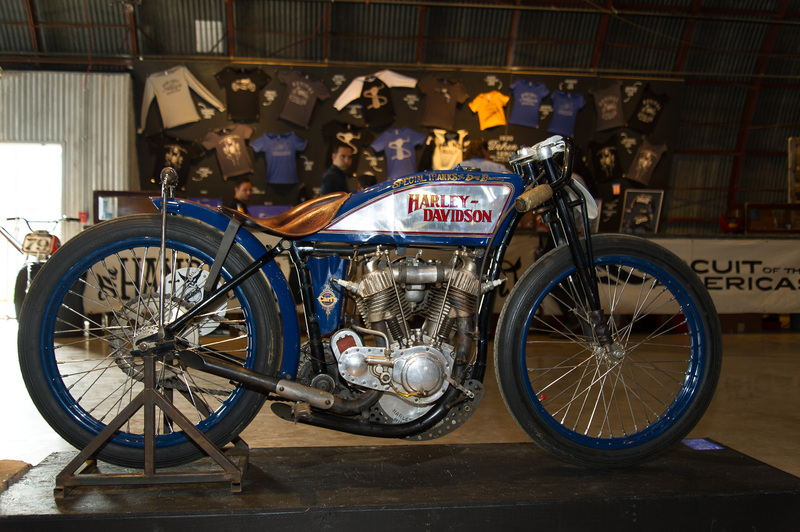 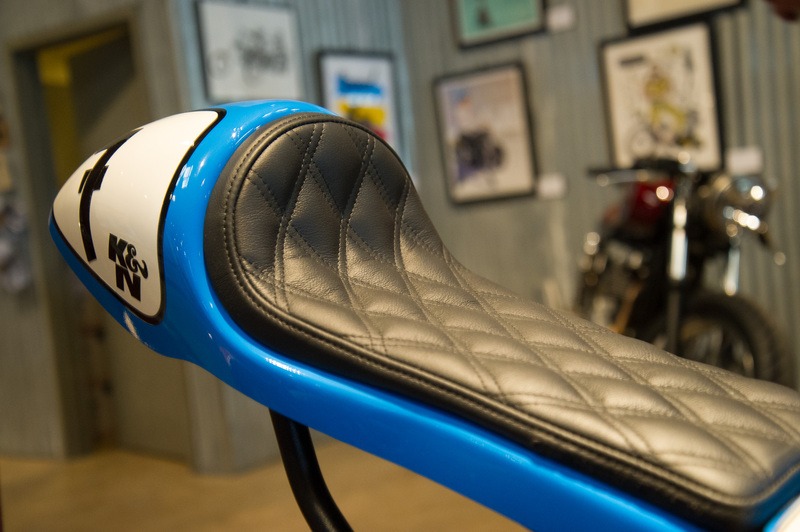 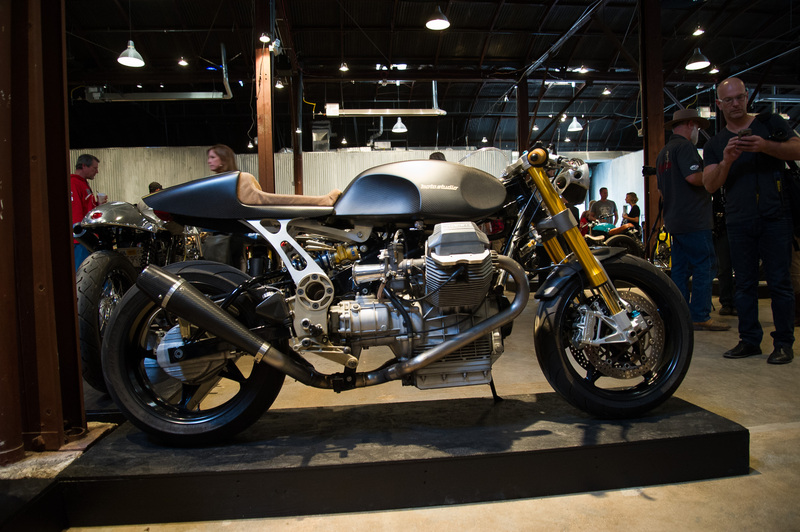 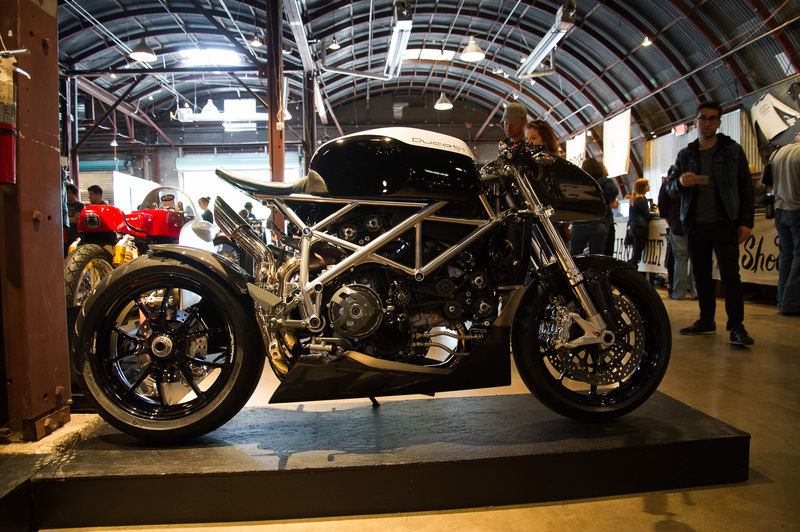 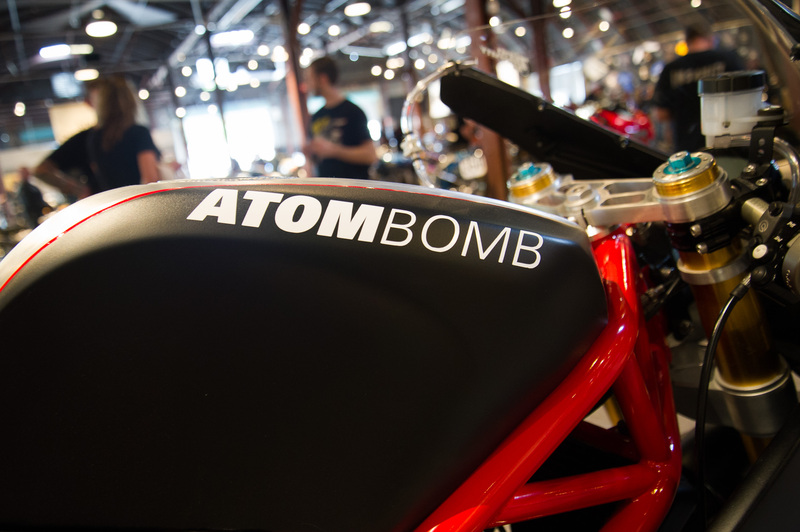 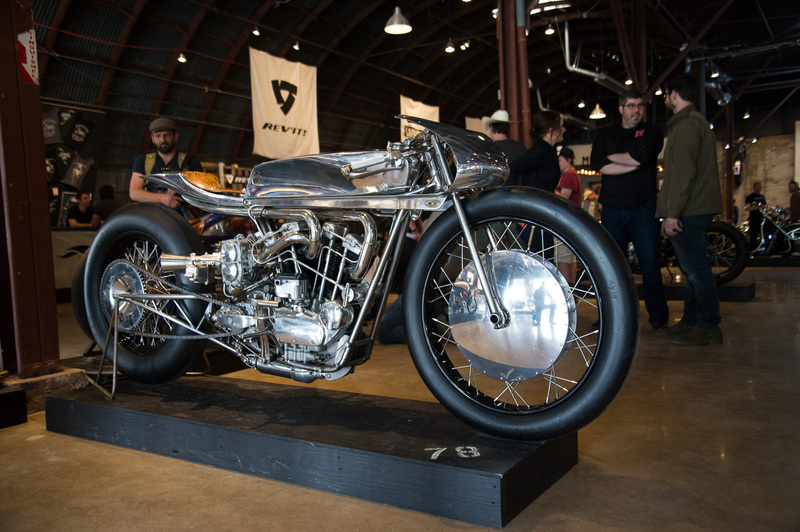 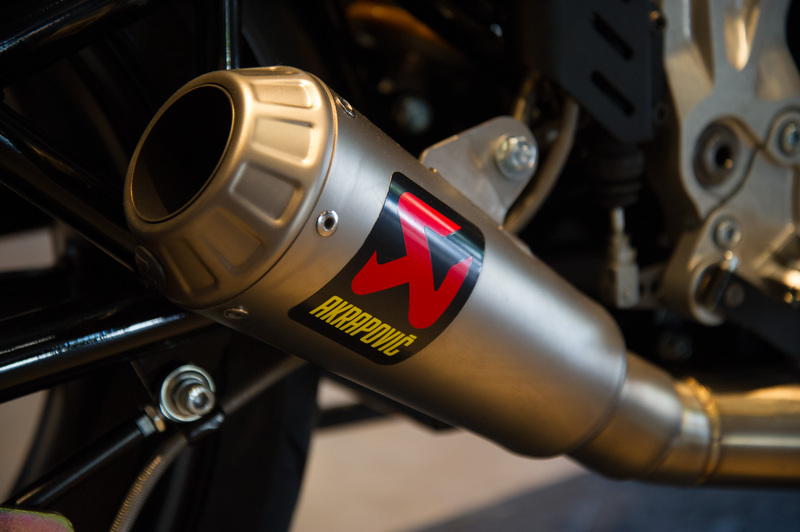 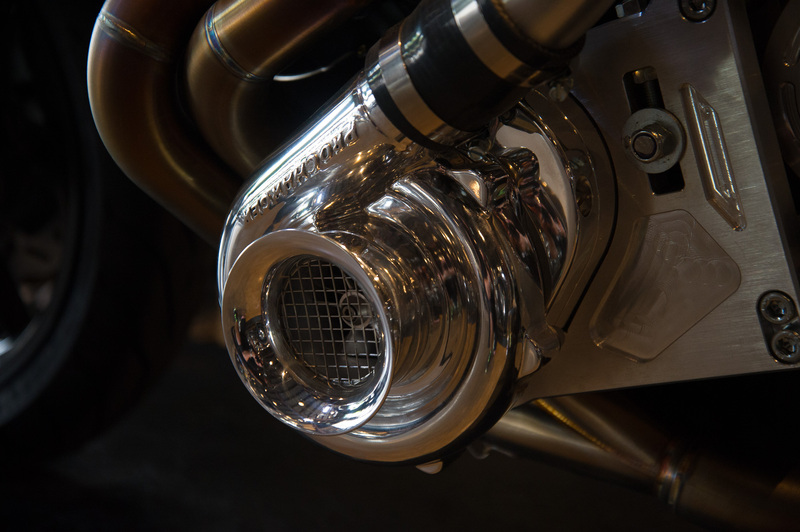 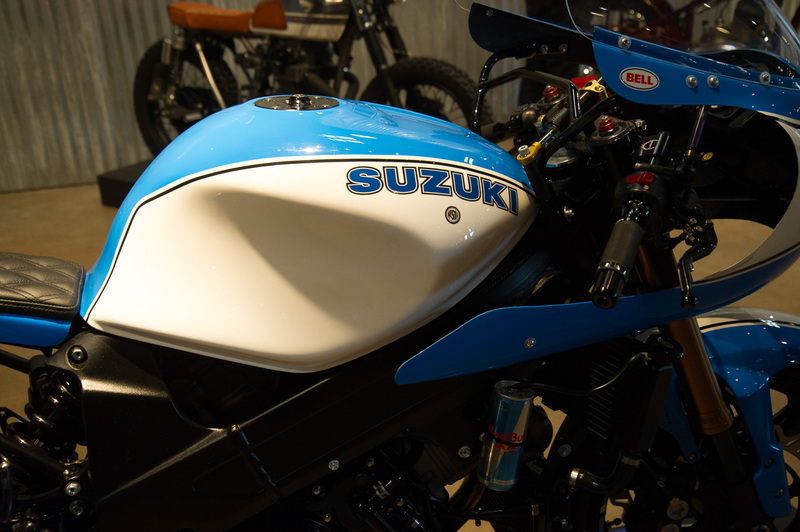 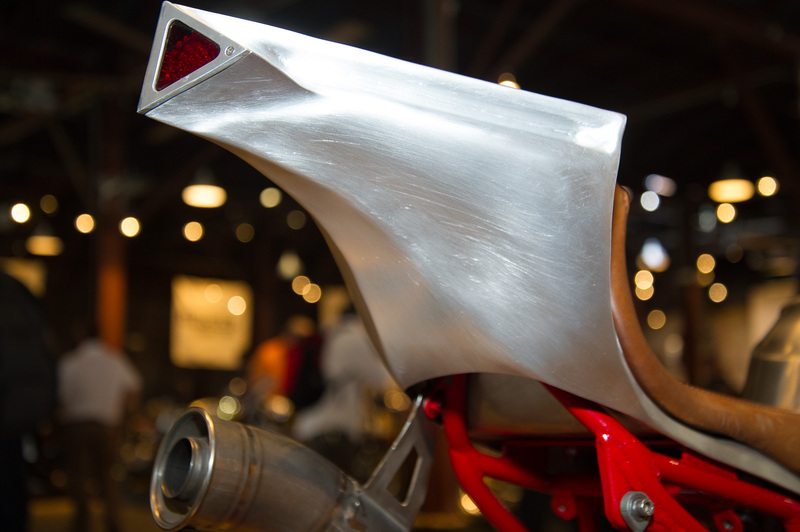 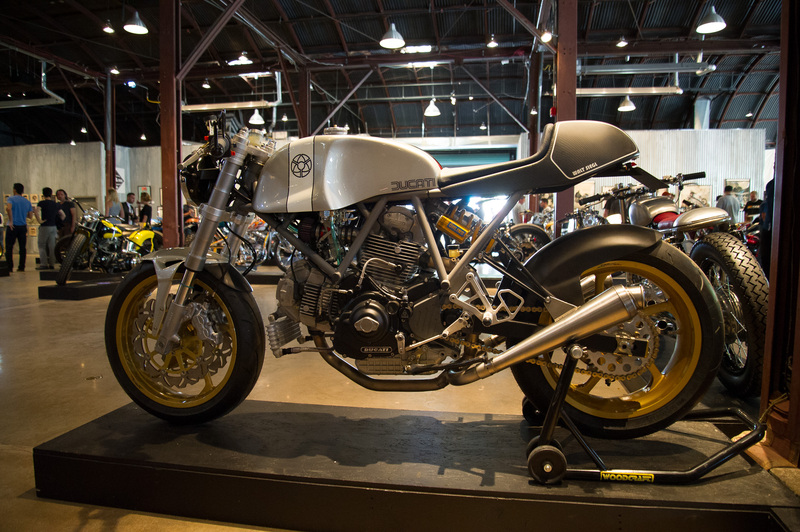 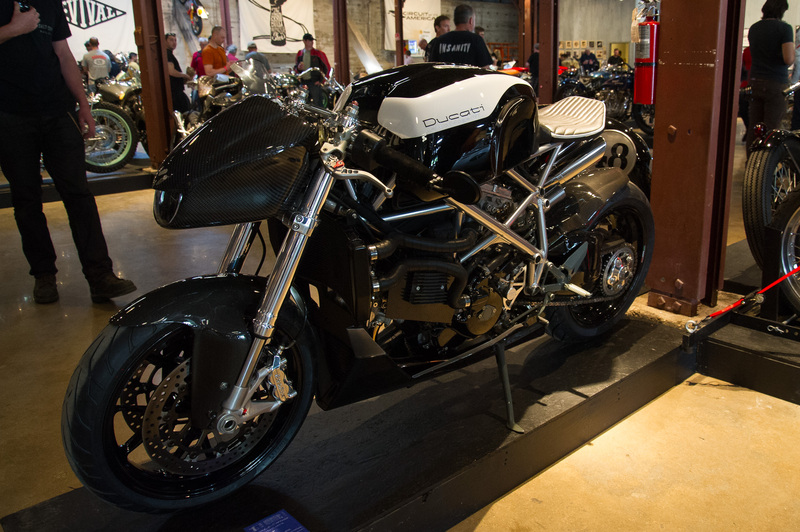 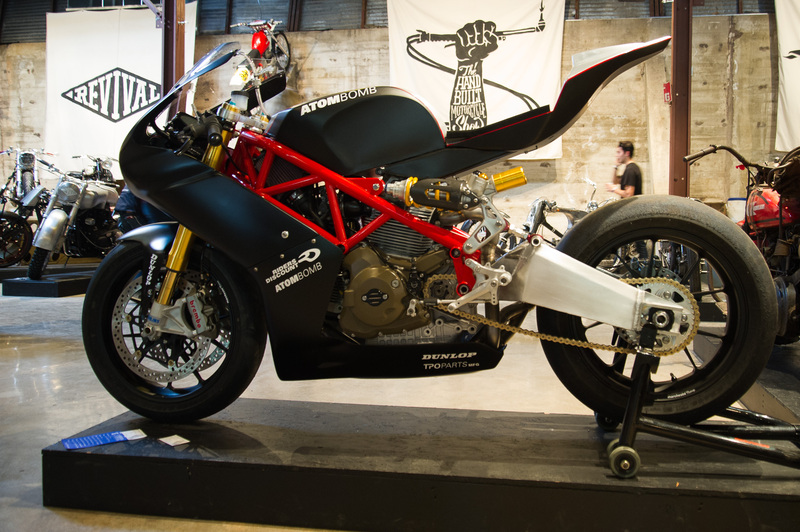 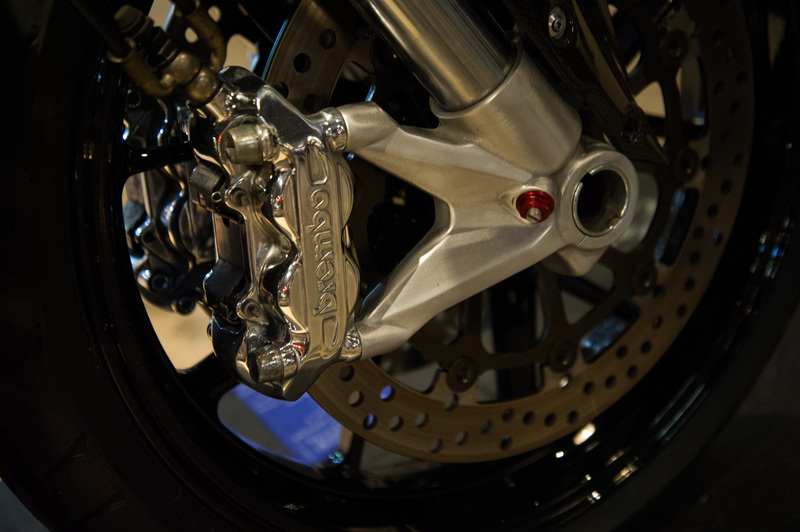 Nestled in the painfully hip downtown area of Austin, the Handbuilt Show is free to the public, and offers a little bit of something for every kind of motorcycle enthusiast: sport bikes to street-trackers, cruisers to café racers…there was even a slammed to the ground scooter this year. 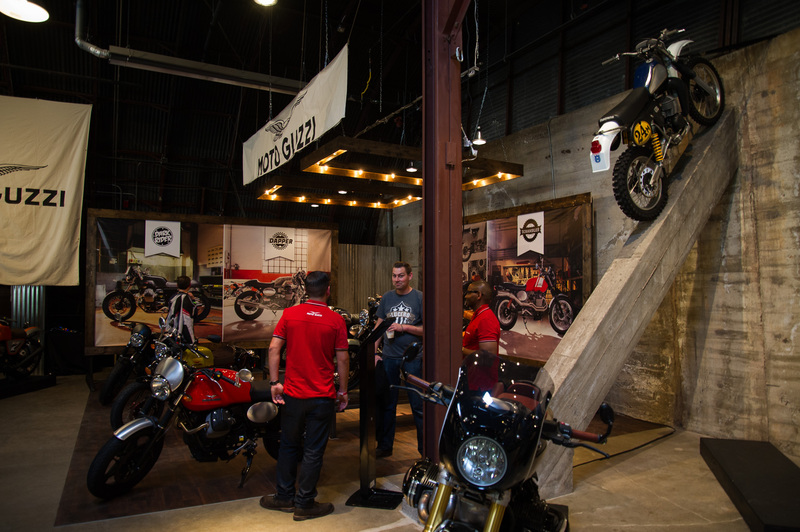 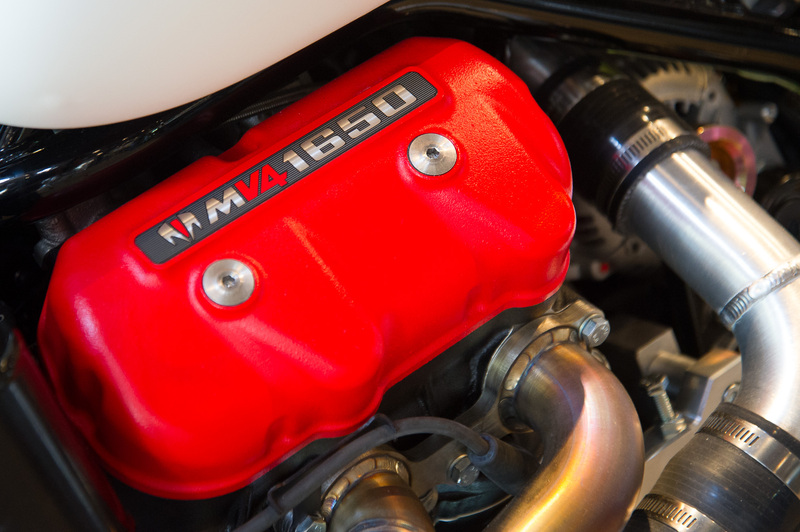 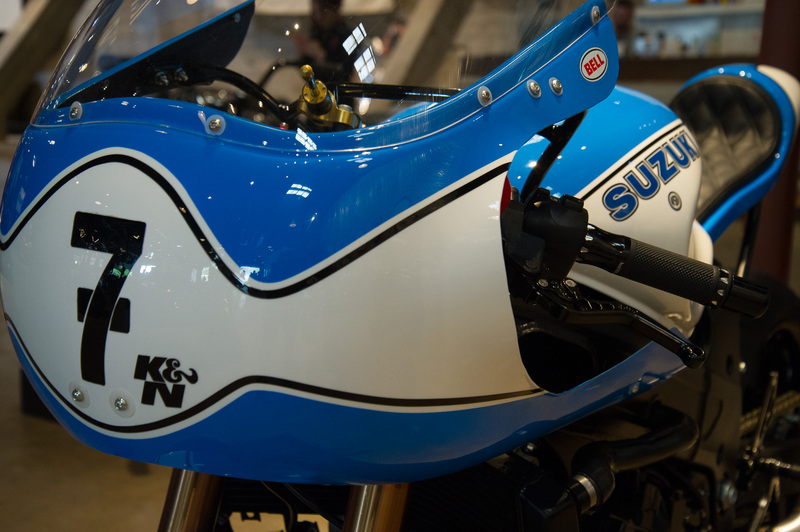 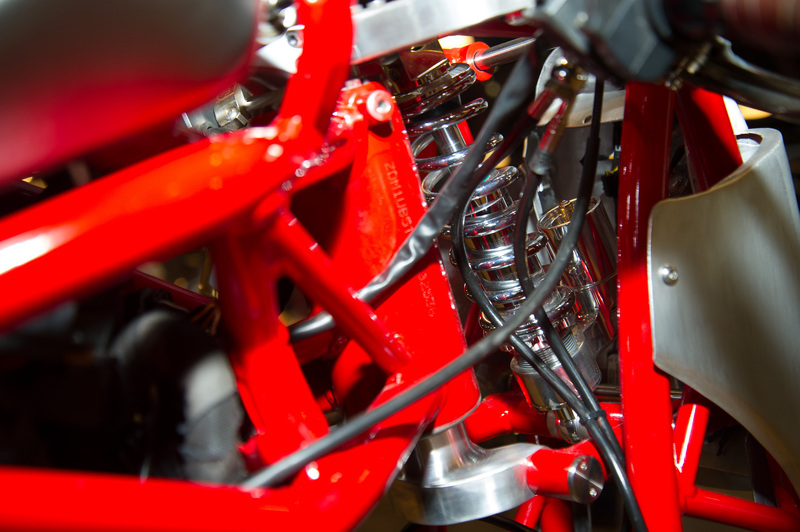 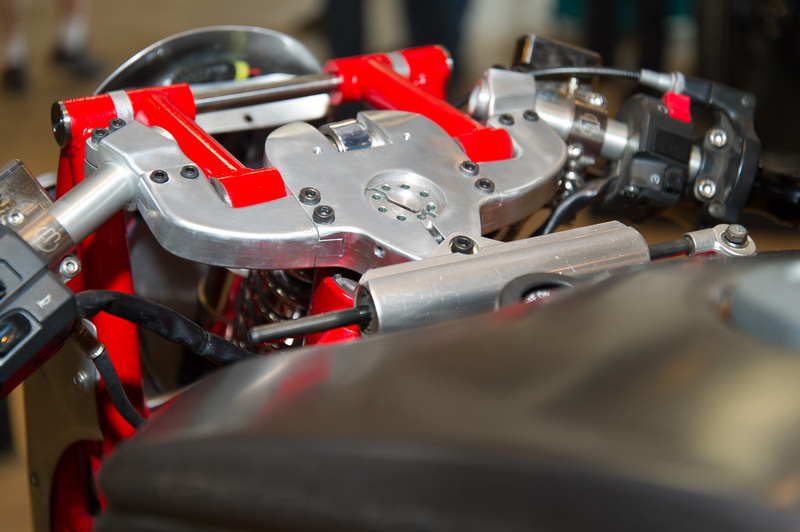 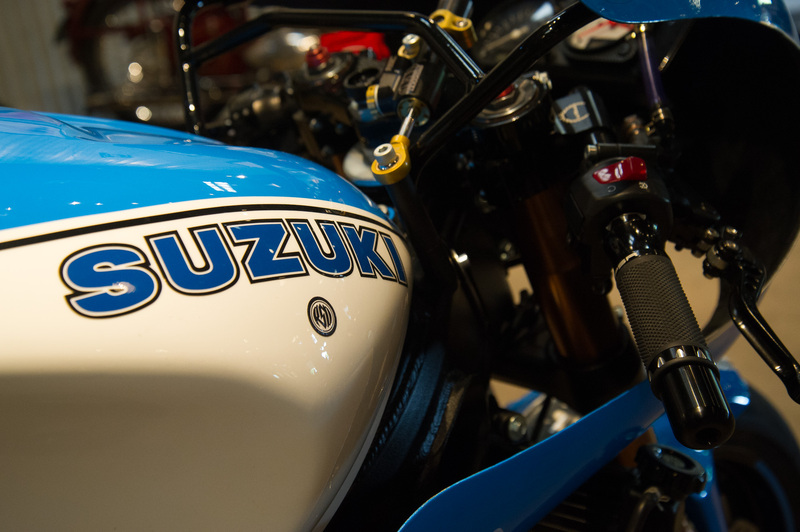 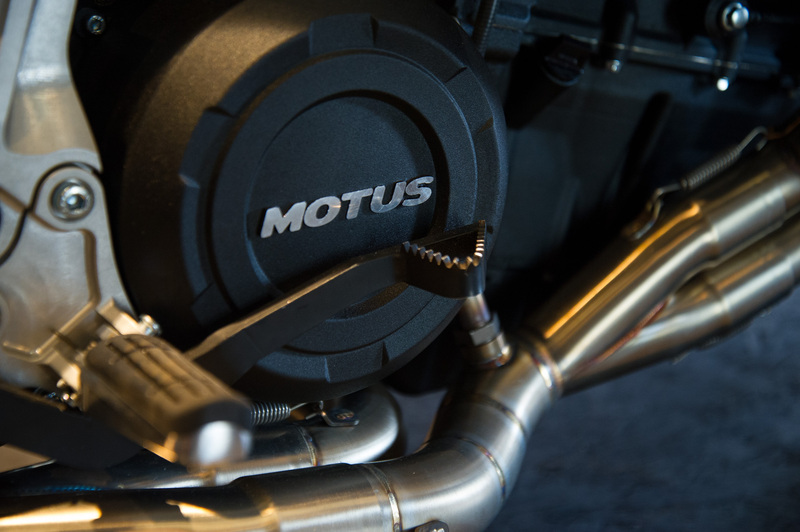 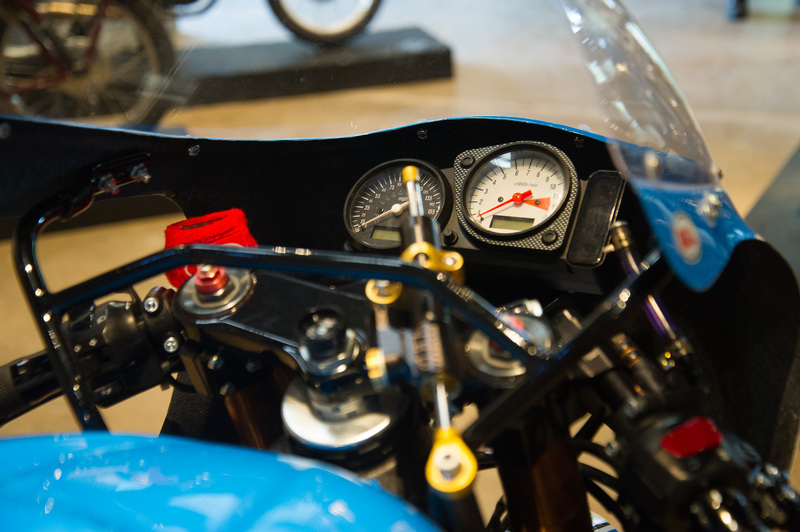 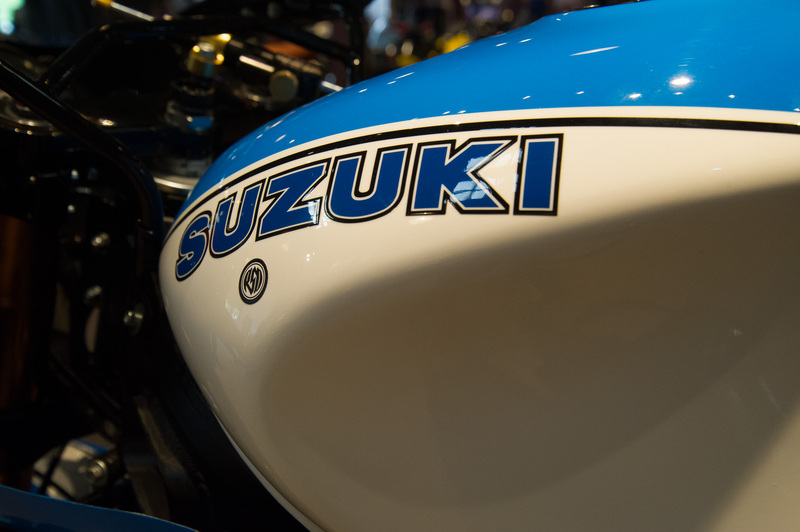 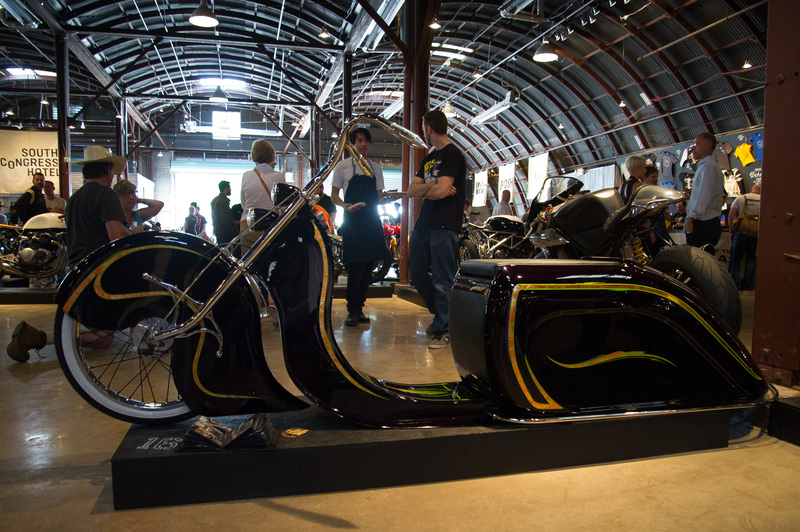 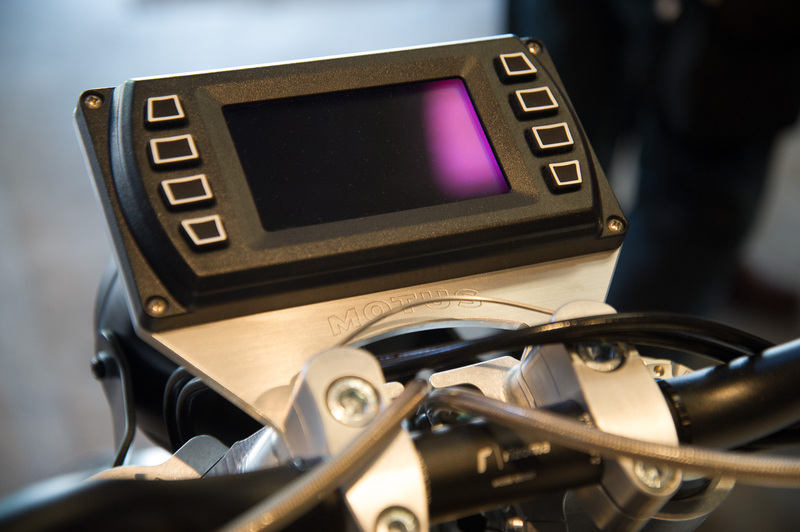 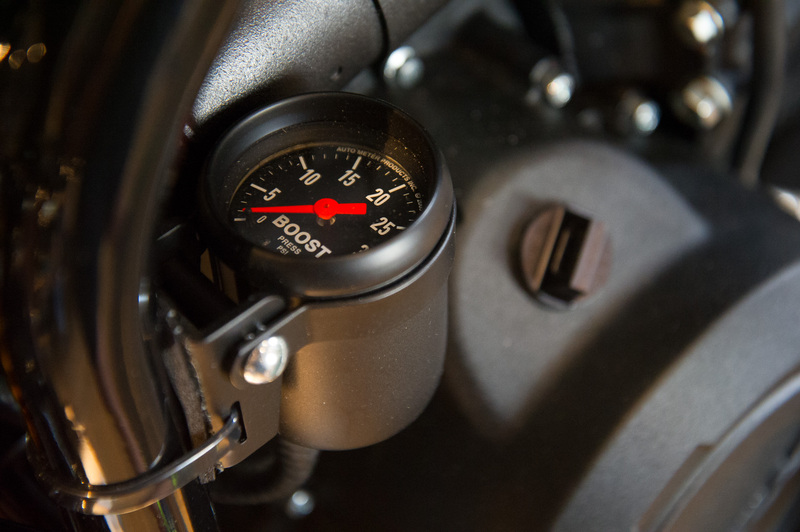 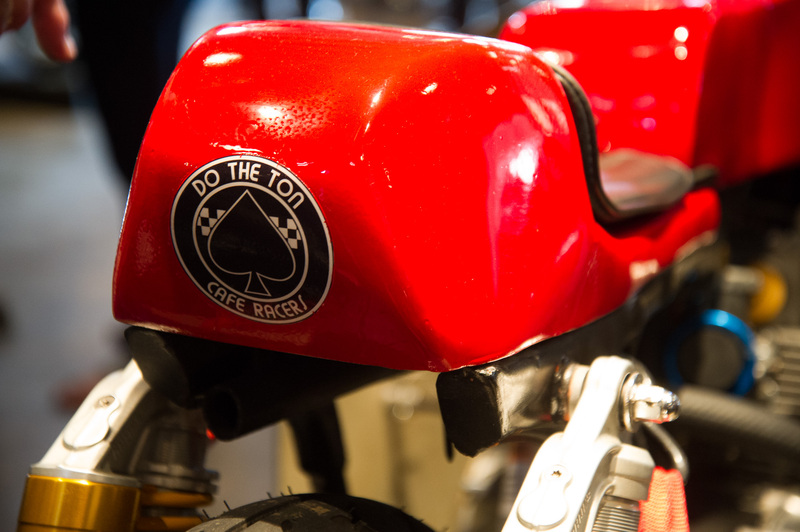 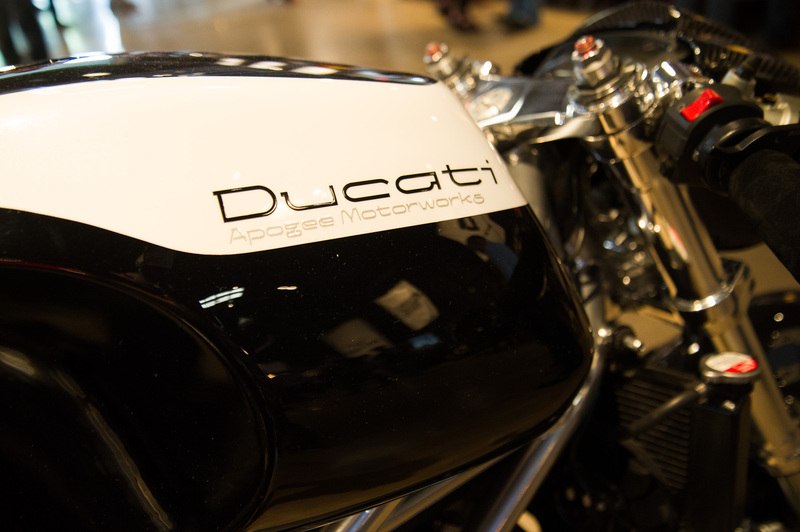 You can easily lose time studying each of the 100 motorcycles are on display at the show. 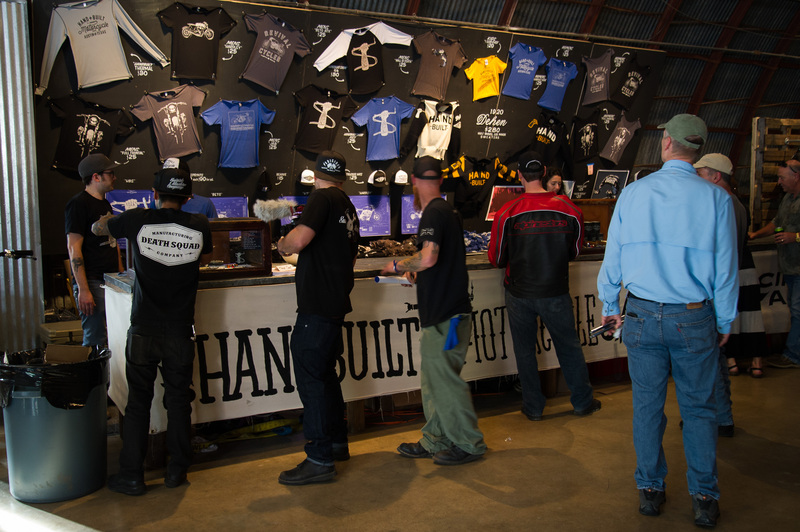 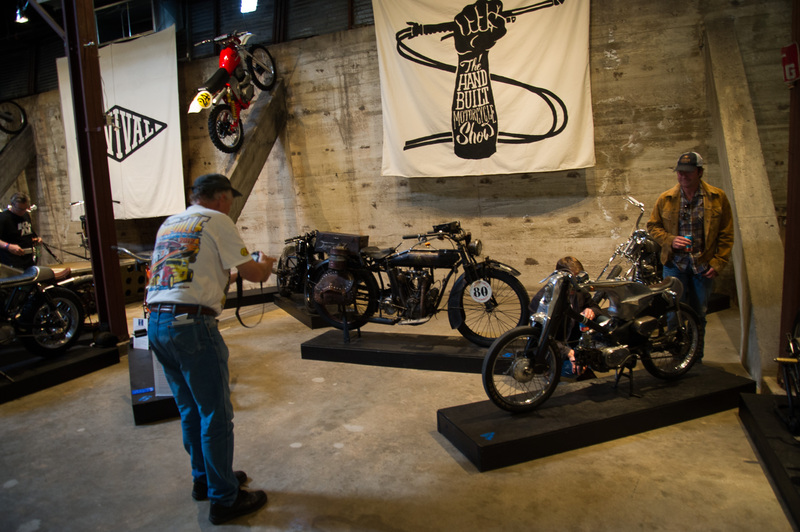 In addition, there is also ample indoor and outdoor opportunities to drink a beverage, an attached gallery of moto-art, and of course the obligatory Wall of Death. 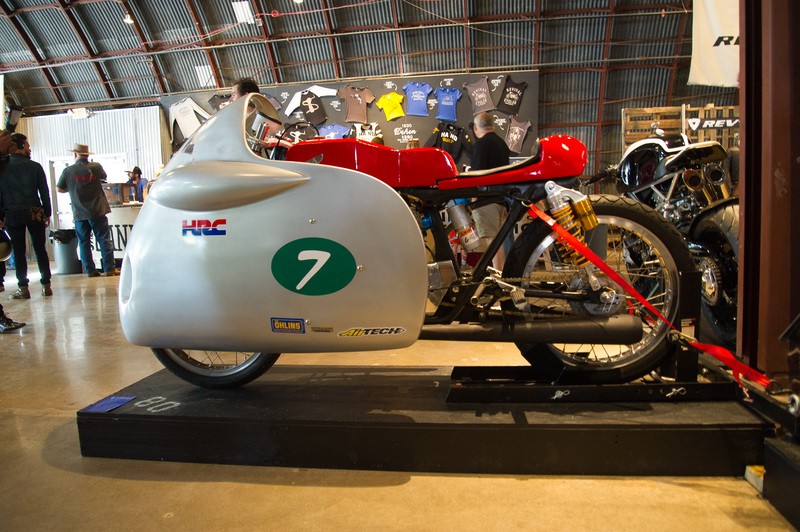 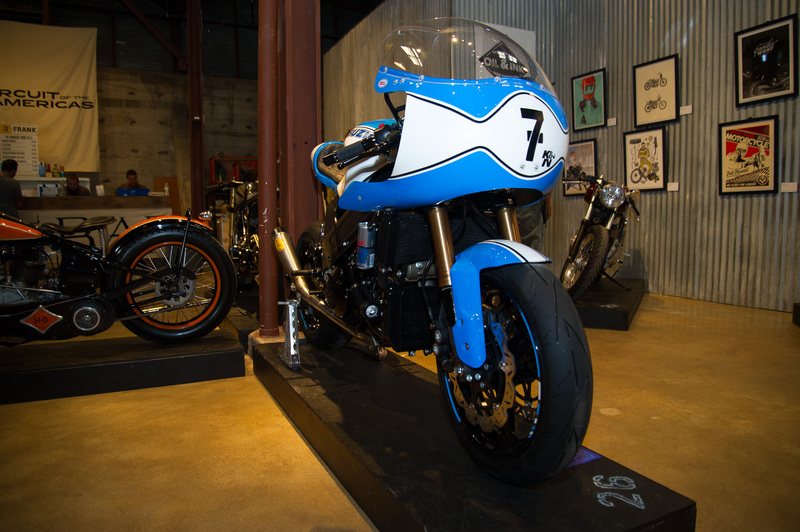 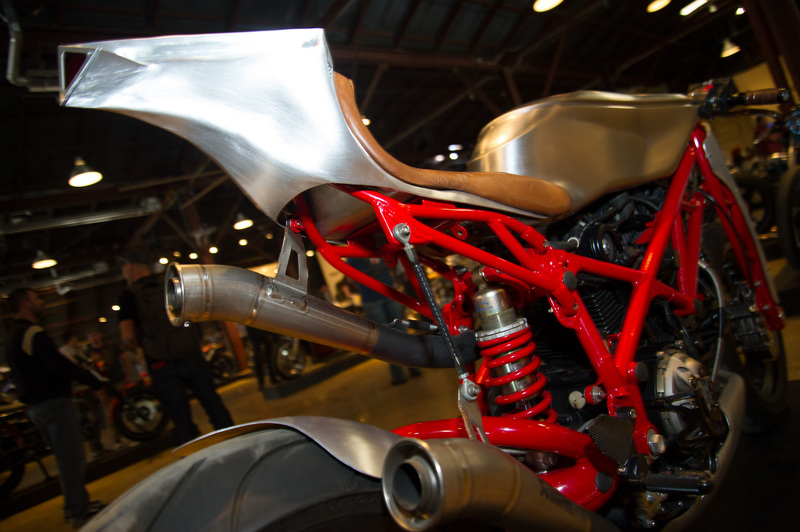 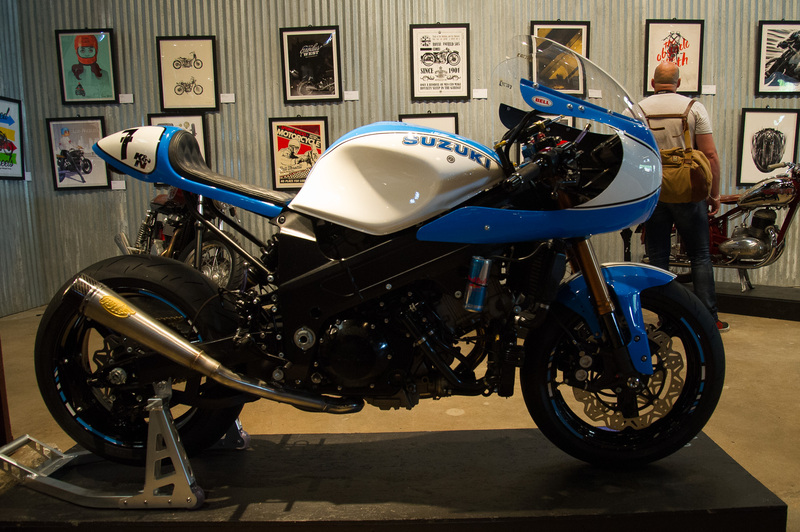 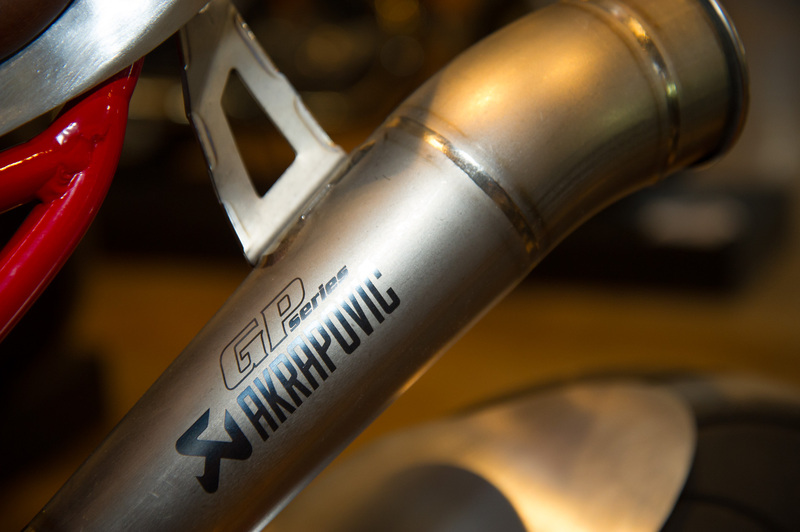 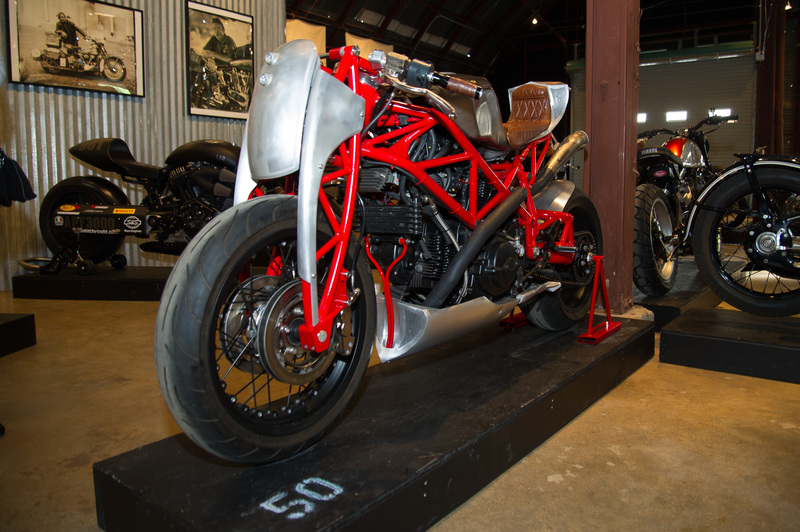 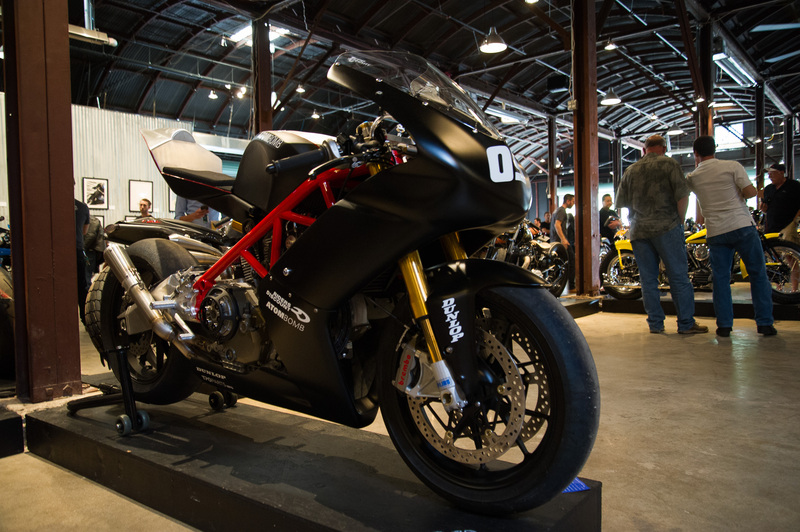 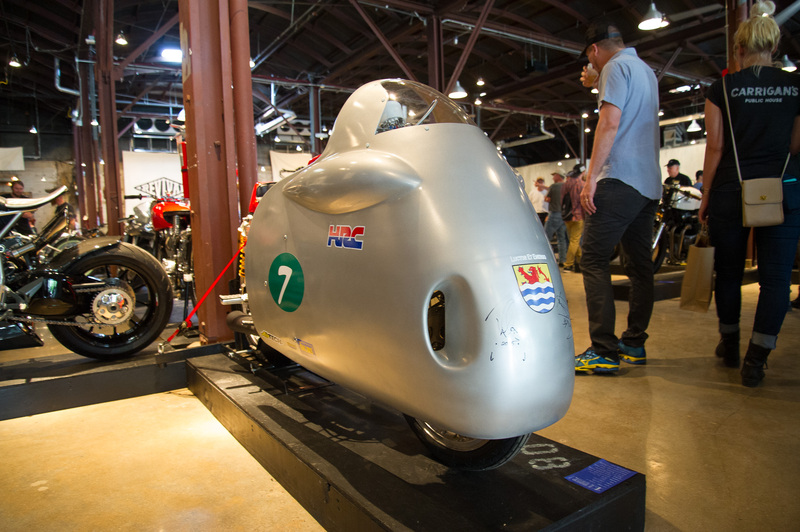 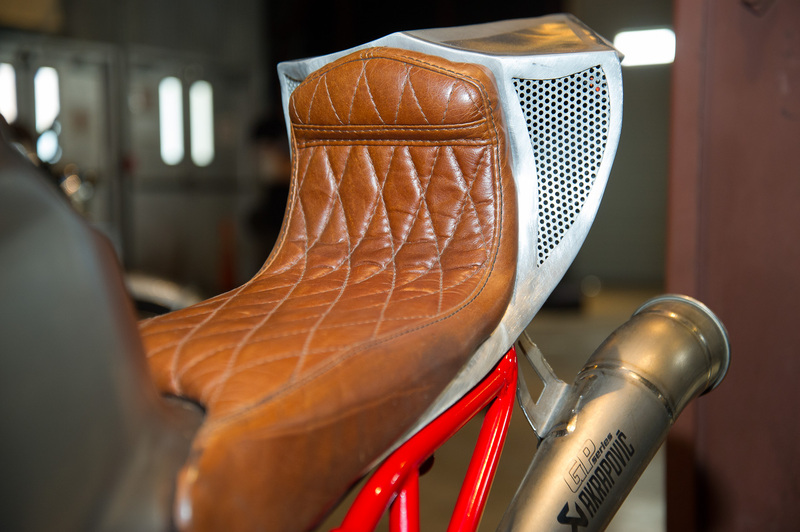 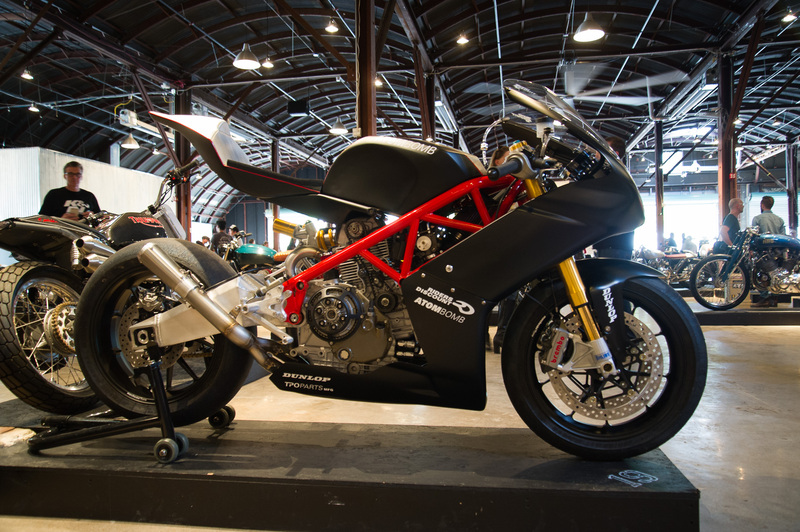 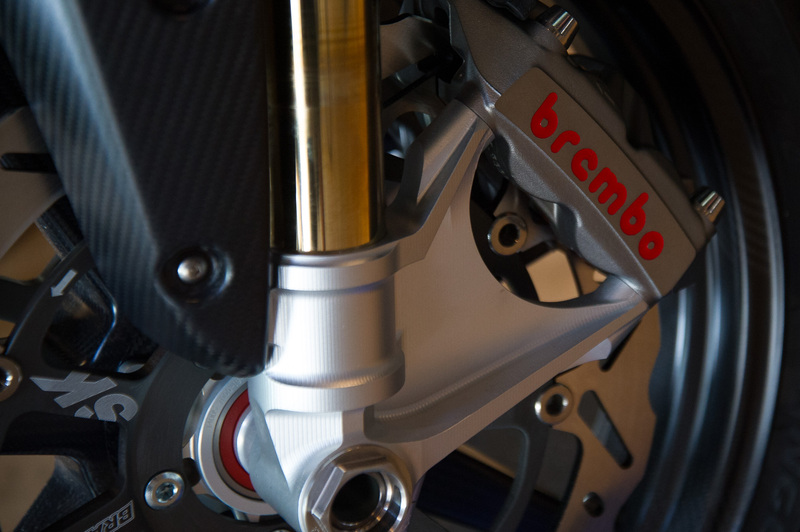 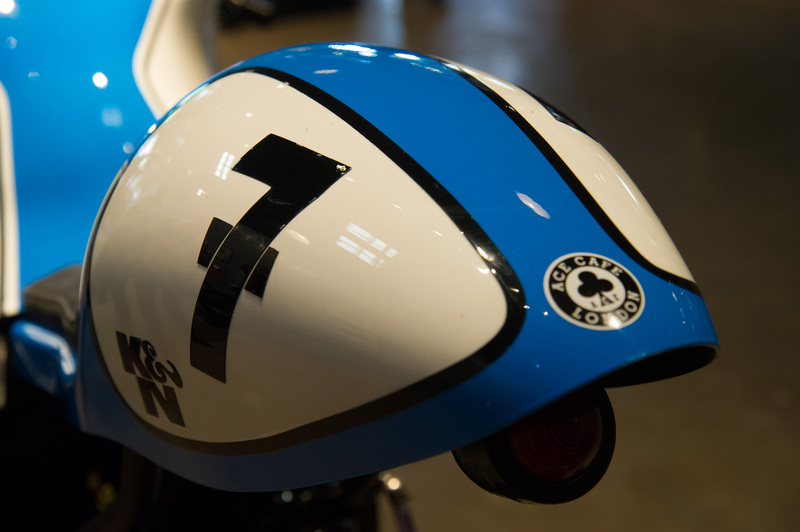 If you find yourself in Austin for the MotoGP round, we highly recommend stopping by the show to see the works of two-wheeled art on display. 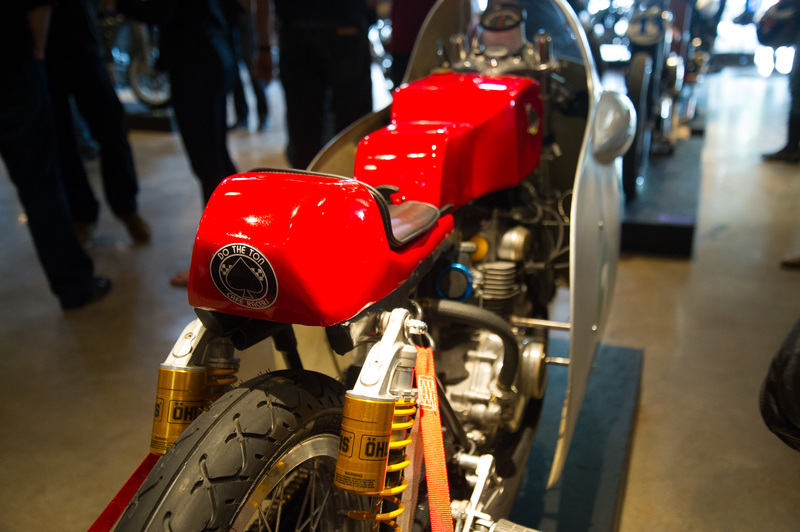 It’s certainly worth the trip, and it’s an ideal place to catchup on the day’s racing while parching your thirst. 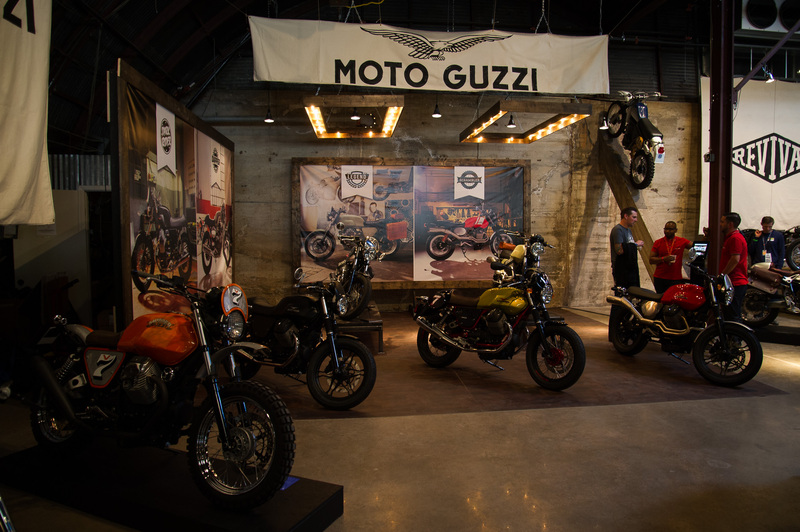 Official hours for the public are Friday, April 10th from 6PM to 1AM; Saturday, April 11th from 12PM to 1AM; and Sunday, April 12 from 10AM to 5PM.